Every once in a while you come across something really… odd. Like this 1957-ish Isetta. Talk about compacts! 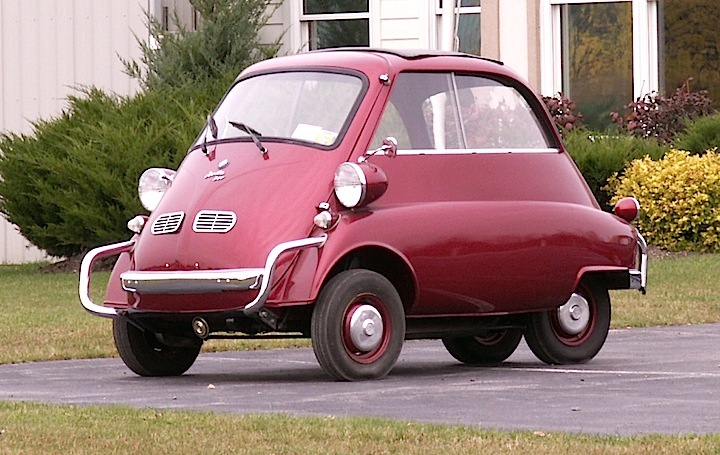 The Isetta was an Italian-designed microcar which was built under license by, among others, BMW! Certainly a far cry from today’s offerings from Munich. While doing a little research on the Isetta, I came across one that was previously for sale on Hemmings.com, which was painted in the livery of a German police agency. Imagine seeing one of these chasing you down the Thruway. Or not. You can see the police “cruiser” at: http://blog.hemmings.com/index.php/2013/10/18/hemmings-find-of-the-day-1957-bmw-isetta-2/ This little red number is something I spotted in an Elma parking lot a few years back. — Jim Corbran, RRofWNY The post RealRides of WNY appeared first on Buffalo Cars.